Today’s lifestyle contains unfamiliar road navigation to get from Point A to Point B, as well as a few stops along the way. It only took a few minutes into my review to discover how convenient the TomTom GO 620 makes traveling roadways and highways. The GO 620 contains features such as lifetime map updates and traffic alerts to make every journey easier. It’s one of the best navigation GPS units I’ve reviewed to date. The multitude of preloaded maps provide directions throughout the continental US. Additional maps and updates are available through Wi-Fi updates via a Smartphone. Wi-fi combined with the Smartphone keeps the price down on the TomTom GO 620 . I found the hands-free calling feature easy to use. With the phone tucked away safely in a pocket, there’s no distraction while calling or talking. The GO 620 accesses Google Now and Siri voice assistants read incoming texts in a clear, understandable voice. Real-time traffic reports are provided free. Use voice-activated navigation by saying the destination address. I received clear verbal directions and did not need to look at the 6-inch screen for additional details or clarification. The interior mount’s shape and magnetic base is steadier and provide a quick-release grip. The rechargeable battery averages an hour of life before recharging is necessary. Download/play music, games, audiobooks, podcasts. The iOS and Android compatible OverDryve weighs about a pound and has a rechargeable 3950 mAH battery that provides up to 6 hours of power before recharging is necessary. Pricing is comparable, leaving it a matter of personal preference when choosing between TomTom GO 620 or the Rand McNally GPS. Lifetime updates relies on GO 620’s useful life as determined by company. 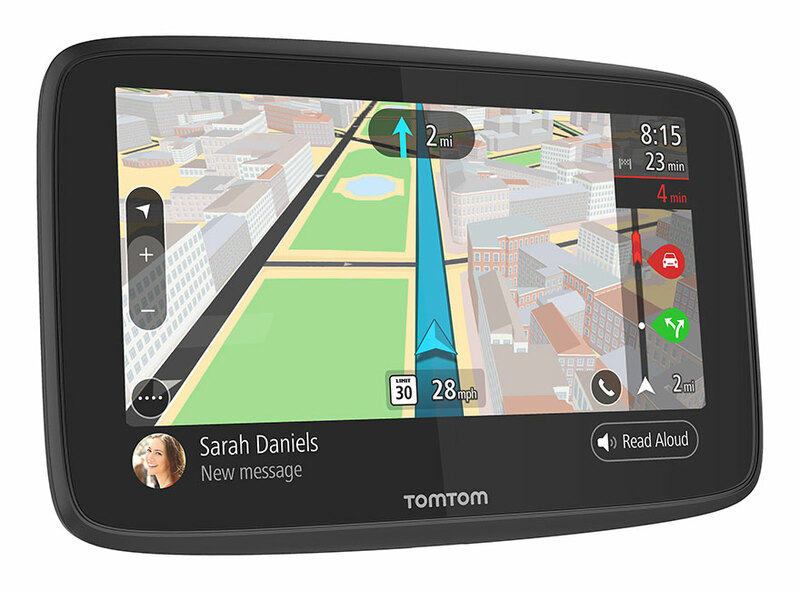 The TomTom GO 620 is designed to promote safety. Features like voice-controlled hands-free calling and voice-activated navigation places the GO 620 among the top GPS systems in today’s market. Maps are quick to update with Wi-Fi connectivity, and there’s no need for a computer to do it. Place preferred routes for a journey in the Smartphone. The data received by the GPS can be modified at the driver’s discretion along the way. It is almost like having a personal tour guide. Be aware of speed limits, traffic hazards, and must-see points of interest. Each is announced with vocal clarity. Free lifetime updates on maps make the GO 620 even more of a bargain with its low price.